"About 15 children came by boat from Lake Oswego, West Linn and Oregon City or by waling through the forest. Some of the students were Native American." Description Have negative of photo. Note on envelope: Film of log cabin on Risley's Landing. The Oregonian. Thursday, June 1, 2006.Concord Elementary celebrates 150 years. 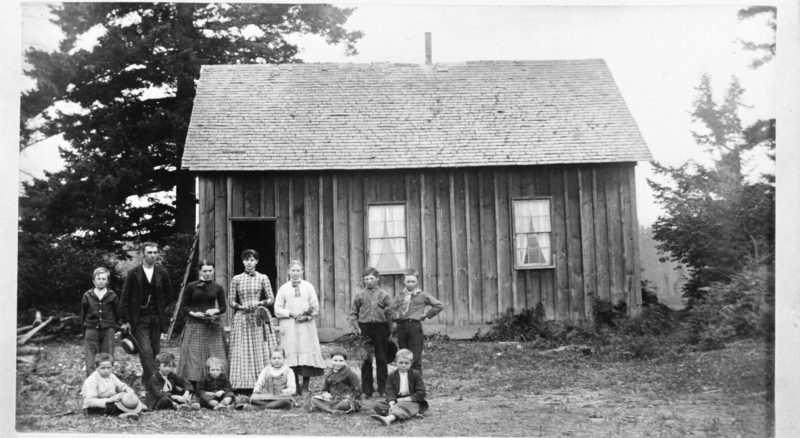 [newspaper caption]: Concord's second school building was built in 1866, replacing a one-room log cabin built in 1856. The third building was built on the current school site in 1890 on land bought from John Oatfield for $175. The bell from the bell tower is on display in the school. (Bottom) Children play outside Concord Elementary School, one of the oldest schools in Oregon. Transcription "About 15 children came by boat from Lake Oswego, West Linn and Oregon City or by waling through the forest. Some of the students were Native American." Physical Description H 7.5" x w 9"